As a child, I used to dream about going on a big adventure. I also enjoyed collecting various things. For these reasons, I am very interested in games that have a premise of going on a big adventure to collect one or more valuable things. Today, I will share a storybook app that takes your juniors to follow Bartleby on his big adventure across the sea to collect a button to add into his collection. 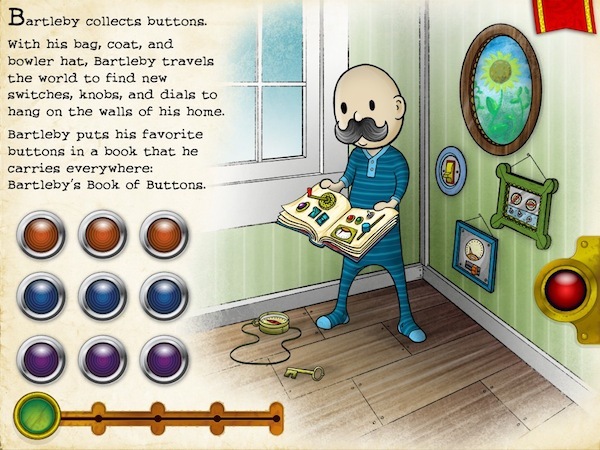 Bartleby's Book of Buttons Vol 1: The Far Away Island is the first story of the Bartleby adventures series for the iPad. Each page in the book is a puzzle. Starting from the first page, you need to find the correct outfit combination for Bartleby among 27 different combinations. Bartleby is a unique character, drawn as an adult who loves to travel the world collecting new buttons, switches, knobs and dials to hang on the walls of his home. In this story, Bartleby is set to travel across the sea to a far away island in order to collect a button, but he needs your help to pass through the puzzles within the book. Each page has a red button on the right hand side, indicating that you cannot proceed to the next page until you have solved the puzzle on the current page. Once you have, the button will turn green, indicating that you can tap on it to continue. You can also pull down the red ribbon to go back to the Table of Contents where you can jump to any page that you have unlocked. Bartleby is set to sail from Crab Harbor to Mystery Island on Mar 23 at 10 AM. First, he needs to wear his signature outfit, i.e. a bowler hat, a coat and his B-bag, and drives his car towards the harbor. Then, as he sails on The Royal Ocean Line, Bartleby is challenged with the bad weather and must help the captain to steer the ship in the right direction. Upon arriving on the Mystery Island, Bartleby needs to use his tools and equipments correctly in order to find the button he's looking for. Unfortunately, when he finally retrieves the button, he accidentally triggers a volcanic eruption that forces him to escape from the island using the big balloon in his B-bag. After successfully flying back to his home, Bartleby hangs the new button on the wall and heads straight to bed. The second page of the book shows a map of roads and obstacles that you would need to overcome in order to help Bartleby reaches the Crab Harbor. Bartleby's Book of Buttons has a series of unique puzzle mechanics. Without going to spoil all of them here, I will give an overview of the first three puzzles - in order to give you some ideas of what the puzzles would look like. If you really don't want to read this part, please feel free to jump ahead to the next section. The puzzles are everywhere, that even to start reading the book you would need to find and press the red star button. If you look at the first screenshot in this review, you could identify that there are 3 red buttons, 3 blue buttons and 3 purple buttons. If you tap one of the red buttons, it will cause Bartleby to wear one of three different hats. The blue buttons and the purple buttons will change Bartleby's outfit and carry-on respectively. To solve the first puzzle, you would need to find the perfect combination of a bowler hat, a coat, and a B-bag among the 27 different combinations. The second page shows a map from Bartleby's house to the Crab Harbor. You would need to turn the ignition key to the right in order to start the car. When the train junctions are closed, you would need to start the train to pass through these junctions. Finally, when the train has passed, you can lift up the road block and change the red traffic light to green to have Bartleby travel safely to the Crab Harbor. The last example that I'm going to give is on the third page. 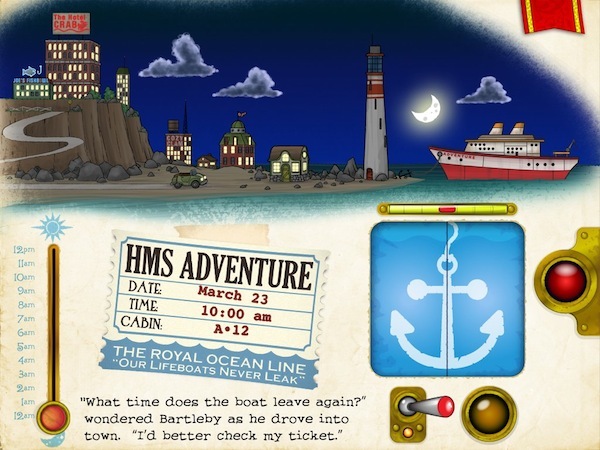 By looking up the information on his ticket, Bartleby needs to turn off the lights in the city, turn on the lighthouse, and slide the time from midnight to 10 AM. Then, the ship will lift up its anchor to start sailing. There are plenty of different puzzles that form real-life activities that your juniors need to figure out and perform in order to move on the next page. I won't go into the details of each of them to avoid spoiling the fun for you and your juniors. In the third page, you need to help Bartleby to board the ship. Look for the hints in his ticket. I personally consider Bartleby's Book of Buttons as more of a puzzle book, instead of a storybook, because of how the puzzles are designed as the requirements to move forward in the story. If your juniors are going to read the book for the first time, I highly suggest you to accompany them because they may need your help to solve the puzzles. Once the pages have been unlocked, they can freely play by themselves. The storybook is a wonderful tool to introduce your juniors to new concepts, such as the compass, inter-cardinal directions, telescope, lens focus, volcanic eruption, hot air balloon, and many more. The book can even act as a good way to start a discussion with your juniors regarding dreams, because Bartleby is pictured dreaming about his adventure as he goes to sleep. I also believe that the book is suitable for bedtime reading, because it has a soothing background music (especially nearing the end of the story) and a happy ending showing the main character going to bed after successfully achieving his goal. You can use this as an example of showing how your juniors can focus on their achievements throughout the day and have a cheerful heart as they go to bed. The happy ending in this book helps make it a good bedtime story and a trigger for discussing about dreams with your juniors. I like the different puzzle mechanics that the book has, where you need to find a good mix of actions in order to unlock the next page. The puzzles are not too difficult either, allowing juniors as young as 4 years old to be able to understand how to solve them with minimum guidance. They are not too complicated and allow some rooms for the players to make mistakes. There is also a nice transition of the storyline as you solve the puzzle. Finally, I believe the book has good interactivity, voice over, excellent background music, and detailed sound effects. All of these add up to the overall enjoyment as you read the book and play the puzzles. The book has a lot of unique puzzle mechanics including this one, where you need to fly Bartleby using a hot air balloon while facing a strong wind. Bartleby's Book of Buttons is a wonderful storybook featuring a great adventure and excellent puzzle mechanics. If your juniors love this app, you might want to check out the second volume of Bartleby's adventures series, i.e. The Button at the Bottom of the Sea. I believe this series is perfect for juniors who love adventures. Finally, if you're looking to learn more about the thought process that went through the development of this great storybook, check out this interview video featuring Kyle Kinkade, one of the developers behind the book.